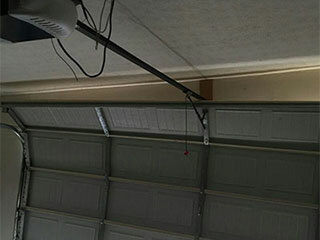 A garage door is extremely heavy, and the opener needs some kind of force balancing it out to alleviate the strain. Springs provide that force and counterbalance the weight so that the door can be opened without an enormous motor. Cables and pulleys connect your springs to the door and to the opener. Uneven wear on your springs can cause issues with the tracks and rollers, so making sure that your springs are balanced will go a long way towards preventing repairs in the future. Your door uses one of two types of springs, extension or torsion. Extension springs flex and extend to store up the force they need to provide balance to the door. Torsion springs twist and untwist to store the same amount of force. Torsion springs are gaining popularity because they are safer, sturdier, and last longer than extension springs, although their slightly higher cost is sometimes a deterrent. Depending on the type of door you have, you may need anywhere between one and four springs. The cables that connect your springs should also be checked for wear, especially the safety cable on extension springs that prevents pieces from shooting everywhere if the spring breaks. Worn springs or cables could be placing undue strain on your opener, making it work harder than it should to make up for the lack of counterbalancing force. Repairing or replacing your springs will help your opener last longer and avoid burning out. Broken springs are often the issue when a door is slanted or unable to move. Get a quality replacement spring and trust the experienced technicians at Garage Door Repair Andover to install it promptly and efficiently. Your satisfaction is our priority, so let us know if your technician was fast, friendly, and knowledgeable. Call us today to book your appointment and get your springs repaired.